hoist higher the flag of Maoism! The campaign for the celebration of the 200th anniversary of the birth of the great Karl Marx – that was preceded by the celebration of the 50th Anniversary of the Great Proletarian Culutral Revolution and the 100th Anniversary of the October Revolution - has marked a leap in the struggle to unite the communists in the world. It is a campaign, principally propelled by the Marxist-Leninist-Maoist Parties and Organizations of Latin America, which is demonstrating a higher ideological, political and organizational unity of a significant part of the International Communist Movement (ICM) and in its development, new forces are joining. Since the campaign for the celebration of the 100th anniversary of the birth of Chairman Mao Tsetung, there was no similar campaign in the ICM. For no one to be confused: the campaigns to support the People’s Wars have obviously not been of the same character, as this is a campaign of Parties and Organizations with an explicit communist character – this fact calls for serious reflection, because it is an expression of how the struggle for unity is developed on practice, putting Marxism-Leninism-Maoism, principally Maoism, the struggle against revisionism and serving the world revolution as a starting point, in summary, how the slogan Unite under Maoism! Manifests. If we see the real state of the struggle for the reunification of the communists in the world we can see that in many aspects we are much better off than we were during the best moments of the Revolutionary Internationalist Movement (RIM), because although the RIM was correctly characterized by Chairman Gonzalo as a “step forward”, he also pointed out - with his proper precision – that “as long as it follows a just and correct ideological-political line” the RIM will be a step forward, and it was, and it served to unite the communists on the basis of the red line and this could be no other than the line of Chairman Gonzalo. That is to say, the principal in the evaluation of the RIM is to state that it served the Proletarian World Revolution – and particularly the struggle to reunite the communists, while it served the struggle to impose Maoism as its sole command and guide - that is to say, the struggle which was led by Chairman Gonzalo - and that it ceased to play a positive role when the revisionists of the “RCP” from United States - taking advantage of the problematic situation of the left due to the bend in the People’s War in Peru – turned to totally hegemonize it. We must never forget that the unity is to serve the revolution and it only serves it, if the interest of the proletariat is imposed. The unity of the communists today in the world can only be achieved on the basis of Marxism-Leninism-Maoism, principally Maoism, or else it is not a unity of communists but a kind of “front” with revisionism and opportunism. RIM was liquidated by revisionism’s handling of the two-line struggle. The maneuver of Avakian was, to state - as a starting point of his “criticism” of the second Right Opportunist Line, revisionist and capitulationist, in Peru – that supposedly “the author would not matter, only the line”, which precisely led to centering the debate on who “the author” was. Or did this miserable not know that the communists of the world would rise when their Great Leadership was questioned? This is how the two-line struggle was derailed. The Problem for the left in the ICM was the hard and complex situation in which the PCP entered after the arrest of Chairman Gonzalo. Although the revisionist positions of both - principally the one of Avakian, for being the head of the right - are still repercussing and the struggle against them can not be declared finished, due to the fact that both fled from the internal struggle in the ICM they can not be taken as the center of the two-line struggle. To state that the center of the struggle is to criticize those two miserables is to put forward the conciliation with revisionism and is to leave the empty field to the right. 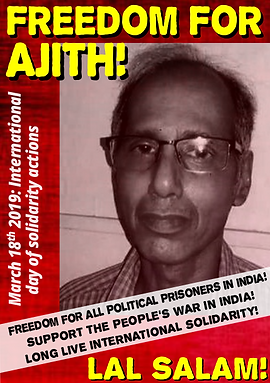 International Call for Solidarity with Comrade Ajith!